New York state produces the most apples after Washington state, and the business has never been so tasty or fun. There’s a particular deep, bright blue in the sky and a slight chill to the air that announces apple season has arrived. New York state produces the most apples after Washington state, and it’s big business. But as we locals know, big business has never been so tasty or fun. A visit to an orchard is an honest connection to our agrarian roots and a true family pleasure. This is not code for “the kiddies,” as all ages effortlessly find a way to enjoy themselves. It’s grandpa enjoying a taste of hard cider, mom checking out what’s in the store, grandma helping the children feed the animals, or dad watching them make cider doughnuts. There’s never a grumpy face going out into the orchard, whether by bus, on the back of a pickup truck or horse-drawn wagon. Fermented cider was the preferred beverage from Colonial times through Prohibition. The temperance movement declared hard cider an evil and made the chopping down of apple orchards a priority and a symbol of their movement. What Prohibition didn’t kill, the IRS did by instituting high taxes on the beverage. Sen. Chuck Schumer, D-N.Y., authored a bill creating a Farm Cideries license that took effect in 2014. The license holds a basket of privileges, including taxation at a rate comparable to beer and wine. New York-labeled cider must be made with 100 percent New York apples. If there are other ingredients used, 90 percent must be New York state-sourced. It takes one gallon of cider to make five bottles of apple wine, making it a value-added product for farmers. The weather has cooperated to make this a banner year for harvest. All orchards described here offer hard-cider tastings, sweet cider, cider doughnuts and pick your own. Some have their own cafes and offer music, bounce houses and other farm pleasures. Hicks Orchard in the Washington County town of Granville is the oldest pick-your-own orchard in New York State, starting in 1905, with trees planted a decade earlier. It was also one of the first to market hard cider 10 years ago, under the name Slyboro Ciderhouse. 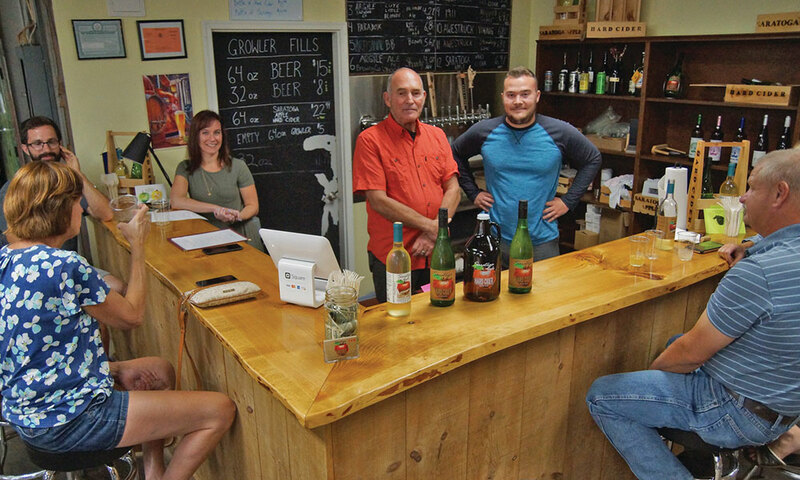 It now offers a full line of still cider, sparkling cider and ice cider (fermented and made with frozen juice), with hard ciders made on premises. Goold Orchards in Castleton, Rensselaer County, has been in the same family since 1933. Goold started its farm winery, Brookview Station, with a pamphlet from the home brew store in 2004. By 2006 it had made 320 half bottles. In 2007, it Whistle Stop White, made from apples, was the Cornell Cup Grand Award winner at the Hudson Valley Wine & Grape Association, beating out 70 grape wines. Goold now makes a full variety of wines, not just from apples, but from pears, peaches and grapes. Their “Joe Daddy Hard Cider” is named for their packing house foreman who has worked there for over 35 years. Goold does not add sugar. What makes its cider distinctive is their use of hops and of Windsor English Ale yeast, which keeps the fruit flavor and does not taste like beer. Remember, beer comes from cooked grain; cider does not. 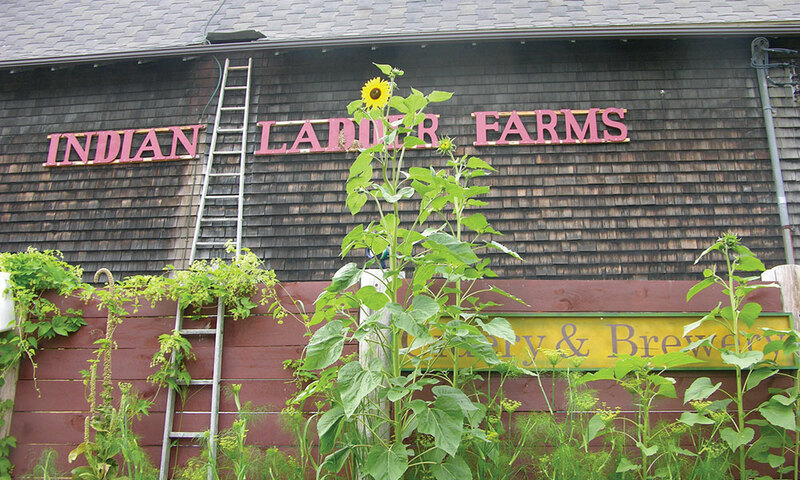 Indian Ladder Farms in Altamont is a fairy tale come to life in Albany County. All the buildings have beautiful fieldstone foundations under green, painted-wood structures, with the orchards laid out pleasantly around them. Across the road is a field of what looks to be Jack’s beanstalks, but is actually hops, grown vertically. 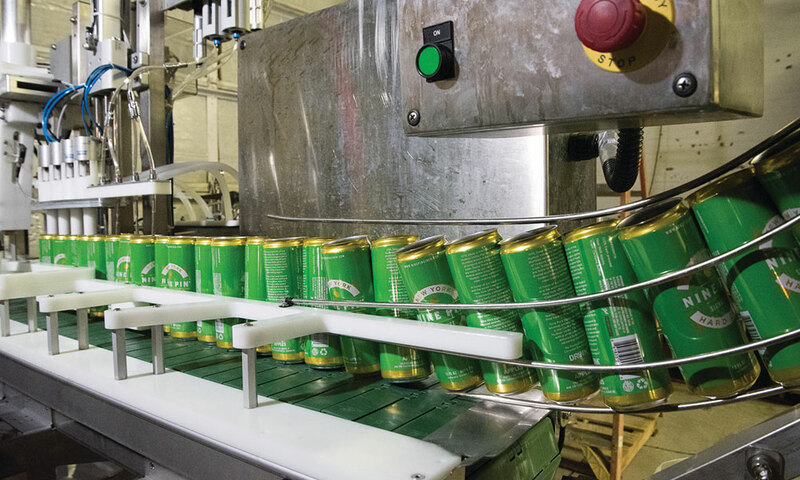 Indian Ladder produces hard cider and beer, using those hops and malting barley grown on site. The tasting room offers beverages by the glass as well as growlers, and is separate from the café. There is a lovely herb garden as well as an outdoor room with a stage — their calendar is filled with events. The bakery and café are open every day, and the gift shop is comprehensive but fun. Saratoga Apple in Schuylerville was bought 25 years ago by Christine Gaud and Nate Darrow. Their son, Eric, is now involved with the business, and he’s the seventh generation of Darrows to grow apples. They offer two fermented ciders. Scrumpy, a traditional, old-fashioned hard cider, is similar to what farmers have been making since the dawn of time. Made with just natural yeast and juice, it’s non-carbonated and quite dry. Saratoga Apple’s Original Hard Cider is slightly sweet, tart and dry, with light carbonation. There’s a tasting room in back and a 12-tap system serves New York hard ciders and wine. It also carries meads and Ethiopian-style tej, a wine, in its coolers. 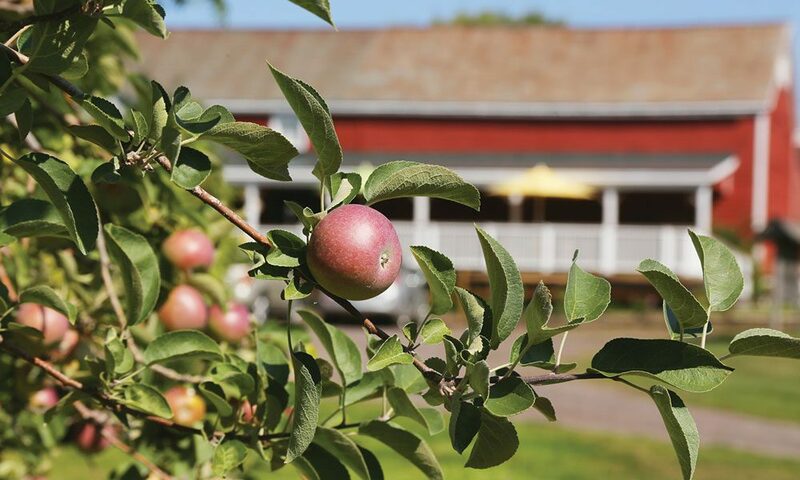 Saratoga Apple has been very active in the local food movement, and now offers pop-up suppers catered by 9 Miles East Farm, no reservations necessary. Cortlands, Macouns or Macs. She often invites the muse to join her in the kitchen, where they make apple cake and play with words.